I picked up Savage Lands from the Survive Humble Bundle probably a year ago now. I made a Logitech G13 profile for it because that is what I do at this point unless the game works with my xbox 360 controller. I have enjoyed this game a lot, the reviews don’t seem to positive and I can understand why. The game feels like Rust and several other survival build games only without other players in the game. The settings of being in a savage land with skeletons and wolves doesn’t seem like enough of a departure to make it better or different form other survival games. 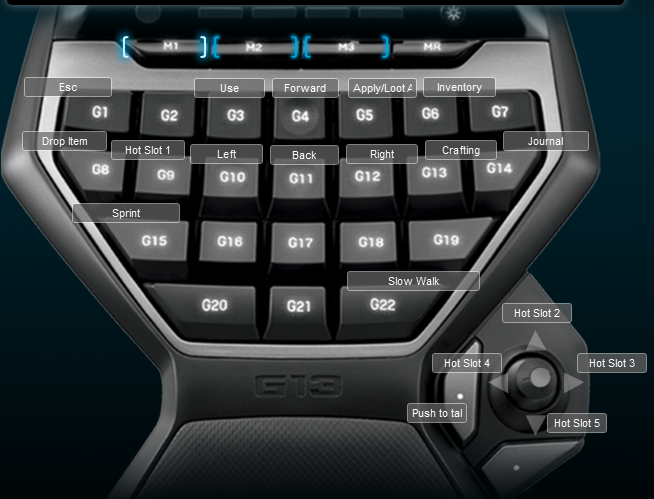 Below is an image of the keyboard layout I use for the game.